For decades, the Department of Defense (DoD) has been collaborating with the entertainment industry to create TV ads, movie theater ads, comics, video games, and websites to glorify militarism to teens and young people. David Sirota, writing in In These Times, calls it a “child-focused military-entertainment complex.” I guess the government’s thinking is that you can’t start recruiting early enough. The products of this unholy marriage between the entertainment industry and the DoD present military service as a glorious and fun adventure. They neglect to show the realities of war—real injuries, real blood, real death. They tell kids that soldiers are saving the country from “terrorists,” conducting humanitarian interventions, and “spreading freedom and democracy” around the world. They hide the truth that they are sacrificing their lives for the protection and expansion of U.S/global corporate interests. A DoD website aimed specifically at teens offers a free downloadable graphic novel, America’s Army which provides the back story of a video game called AA3. Together, they send the message to kids that life in the military automatically makes one special, professional, bold, brave, tech savvy, and powerful. The Army creates and distributes America’s Army so that young Americans can virtually explore soldiering in the U.S. Army like Soldiers experience it—as individuals and as members of teams. Through the Game’s virtual experiences, young Americans can explore the Army from basic training at Fort Benning, Georgia, and medic training at Fort Sam Houston, Texas, to operations in defense of freedom. Along the way, they can join elite Army units and experience the strength of Army teamwork, values, and technology within an engaging environment. The game has become an online phenomenon, consistently ranking among the most popular PC action games played online. The games are rated T for Teen and can be downloaded free via Steam and from various partners listed on the www.americasarmy.com website. They are also distributed at local Army Recruiting stations, ROTC Detachments, and Army events. The latest DoD ad is based on the 2011 summer blockbuster film, X-Men: First Class. 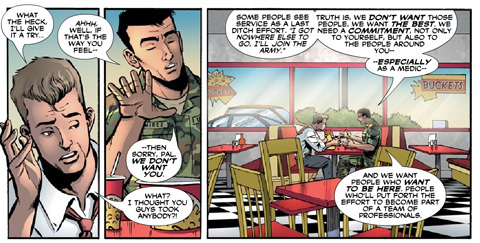 It takes army propaganda to a new low, suggesting to vulnerable, pimply-faced teens that the military could make them a hero and give them super powers.